I’m watching my 6-month old baby girl in her jolly jumper and I love her with all my body and soul and the fact that she is here and that I gave birth to her and that she grew inside me still blows my mind. I still can’t believe I pushed a real live baby out of my body and into this great big world. I grew a healthy baby and I gave birth to her and for that, I am proud. I couldn’t have done it without my loving husband Jacques and my amazing doula Lesley and Rona, the experienced nurse. I was given the opportunity to tell my story and I didn’t think twice about sharing my experience or not. Most likely you are pregnant, and like me, preparing for childbirth partly by reading birth stories. I hope this one helps in your preparation. I didn’t want an epidural even though I was scared. It was a personal choice that I made based on research and emotion. I had hired a doula and made the choice to prepare for a drug-free birth during my pregnancy since I was having a regular run-of-the-mill pregnancy. Everything pointed in the right direction for an unmedicated birth, so I prepared for it. 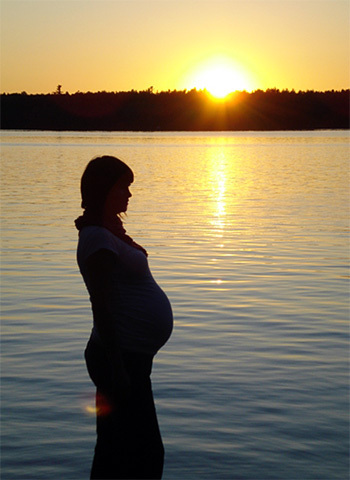 The pregnancy started off terribly, with severe nausea that lasted 20 weeks. I remember walking to the metro to go to work and throwing up numerous times in the snow bank. Then walking home from the metro, I saw all the spots where I vomited. Nice eh? I felt no one understood how terrible I felt. People would offer advice “try lemon in hot water, ginger in hot water, orange peel in hot water”. Whatever, nothing worked! I would come home from work and vomit because of the smell of the stairs in my apartment. I couldn’t handle any type of cooking or food smell and I had an extremely strong aversion to garlic and onions and to anyone who had consumed them within 3 days. My baby is mostly made of fruit. She is really healthy, don’t worry. I was also stressed because my OB GYN scheduled me in for a C-section since my baby was “breech” in a 20 week ultrasound. I didn’t agree with this practice, even if it was to book the OR “just in case”, so I switched practioners to a family doctor. Then the nausea went away and I felt great except for some acute pubic bone pain, but that was easy to handle after feeling nauseous for so long. Now, I was so happy to be pregnant. I loved preparing for labour by reading good books, talking to people about their birthing experiences (especially Lesley) and taking yoga classes and a weekend workshop with Clearlight. I worked hard at overcoming my fears surrounding labour and birth. I found pregnancy empowering. I thought I looked great; I loved putting on an obnoxious amount of weight near the end, I found it hilarious. I hung my rings around my neck because they became too small. I used my friend Jen’s terminology and called my swollen ankles “cankles” because there was no difference between the circumference of my calves and ankles. I never had that feeling of “enough is enough, get this baby out”. I enjoyed every last minute of being pregnant (after 20 weeks of hell of course). Anyhoo, I was waiting for my baby to come after finding a bit of spotting for a couple days. We tried some fun things to start labour but to no avail-- so Jacques and I decided to go for a walk. We both knew it would be the last walk we’d take as a family of two. We walked/waddled for hours. We walked from Verdun along the Lachine canal into Old Montreal and up to Chinatown. I knew something was up when I couldn’t finish my Pho. We took the metro home and set up our birthing den, which involved pulling out the futon, throwing some pillows on it and setting up the computer to watch a couple episodes of Mad Men. I think I emailed Lesley to give her a heads up that we might be calling the next morning. We went upstairs to bed at 10:30pm and I woke up at 11:30pm with cramps and diarrhea. I slept on and off until 2:30am when my body wanted to stand and lean against the wall during the contractions. At this point Jacques got up and we migrated downstairs to the den. Jacques made coffee and I managed the contractions very well by breathing and humming and blowing raspberries with my lips. I enjoyed lying on my side between the contractions, then getting on my hands and knees on the bed to live through them. Jacques rubbed my back, warmed up the “Magic Bag” numerous times and rubbed my back with that. He was by my side the whole time. He was my rock. At daybreak we went out into the yard and focused on the flowers, the grass, the dew and the air. Walking really helped me. We’d look at each other and I would say “we’re having our baby”. This fact seemed so sacred. I would walk and then lean or hang on to Jacques and live through the intensity of my body opening. When we felt it was time, we called Lesley and she came over soon after. We went to the hospital right away as she assessed it was time to go. The contractions were long and coming right on top of each other. When we got to the hospital around 8am I got immediate attention (I guess I looked pretty ripe) and we went to Labour Room #1. It was clean and bright and had a big window looking toward the Oratory. The resident came in a checked me and I was 6cm dilated, not that that means much. After rhetorically saying “wow, it seems like you are in a lot of pain”, he offered me an epidural. I just looked away. That happened twice. I labored on my hands and knees, on my side, hanging off of Jacques, in the Jacuzzi, and in the shower. I really liked the hot and steamy Jacuzzi. Lesley was great because she would suggest little things to do just at the right time and then as soon as I would try her suggestion it was just what I needed. A little massage, a little whiff of an essential oil, a little sip of water, a shower, a bath. My body also told me what to do. I really wanted to walk then turn to hang off of Jacques or have him hold me by my underarms and squat down. That was my body bringing the baby down. I liked being on my side and my hands and knees. My body instinctively knew positions to help the baby move down. My body loved moving and making noise. I didn’t care if I was loud, I needed to be and it was my birth. I used all the sounds and moves I learned with Clearlight and then some. I relied on my voice and movement to focus on making every contraction work so my baby could be born. It was a primal instinct--deep strong long sounds and some chanting helped. I chanted “open” and imagined my cervix opening. I really tried to imagine my body opening for my baby. I really tried to keep my body relaxed and especially my jaw and throat. This helped me a lot. I remember getting so tired that I felt like I wouldn’t have the energy to continue using my voice. I later learned that I was in “transition” for three hours. I wasn’t really interested in time or measurements until this point. I really tried to take it one breath at a time, but it was hard to do. Labour gets really tiring. Labour is really hard work. It takes a lot of focus. I became exhausted and around the same time I started feeling resigned and that I couldn’t do it anymore…I just couldn’t focus anymore. I screamed, I cried, I was desperately looking for a way out. The pain was out of this world. It was so brutal and I was so tired. I lost my grip, my rhythm, I lost my courage. I honestly didn’t think I would make it--I thought it was so unfair. I felt sorry for myself. I thought C-section. I thought epidural. I verbalized both these thoughts, even though I didn’t want them. Luckily, Lesley knew what I felt in my heart of hearts and it was too late for both. I tried giving up, but that didn’t work because the contractions kept coming. I couldn’t stop them. I was so scared. I thought it would never end. I begged for something, anything, to take the pain away. -Please! Some gas!! Just to take the edge off!!! -I know Allison, but we don’t have any, said Rona, the nurse. -You can do it, believe me, you can do it, added Lesley. It was during this hard time I needed Jacques and Lesley the most. It is because of this hard time I say I couldn’t have done it without them. Lesley and Jacques encouraged me and had such complete faith in the birthing process and me, that with incredible focus I could use my voice again to make deep sounds and face the facts. I found some crumbs of courage and connected with my baby. I moved on through by the skin of my teeth and soon after it was time to push my baby out. I didn’t feel the urge to push as I had imagined I would. Instead I felt like my back was splitting open. Initially I hadn’t wanted to be told how to push, I had imagined that I would push my baby out in a squatting position or on all fours. I tried pushing in those positions, but my pushes didn’t seem very effective. Rona understood my wishes and asked gently if she could make a suggestion on how to push to get the baby out as fast as possible. I agreed. I let go of my vision of letting my body tell me how and when to push. I was in a semi-sitting position holding back my legs and Lesley and Jacques were helping me too. I was happy there were no stirrups, no metal, and no funky bed that came apart. I didn’t want any of that. I seem to recall that the doctors were not wearing scrubs and I liked that. Rona and Dr. Zampini would tell me to push and I would push as they instructed. No one got worked up, no one was screaming at me. I was OK, but extremely tired and needed a lot of encouragement, which I got from everyone in the room. Pushing is very tiring. It was really hard. But, I did it. I have never been so exhausted in my life and yet, had to keep working. I couldn’t give up. At one point, Lesley told me to feel inside. I felt my baby’s head and that gave me enormous strength. After about an hour my baby’s head was crowning. I focused hard on relaxing my perineum and giving tiny gentle pushes. Maybe that prevented me from ripping, who knows. I watched my baby’s head enter this world. The resident checked for the cord and then did something with the baby’s shoulders, which was uncomfortable. I don’t know if a midwife would have done the same thing. I think I told him to be gentle. After our baby’s shoulders were out Jacques’ hands were ready to welcome our baby into this world. She turned from bluish to bright pink as she took her first breaths while her bottom half was still inside of me. It is an incredible image to have imprinted in my mind. Our baby was born into her daddy’s big loving hands. He brought her to me and put her on my belly. I couldn’t grasp the reality of it. I was over the moon. I was ready to dance. I shouted out words of love and profanity. There was nothing I could do to celebrate enough. It was ecstasy. It was pure white light. It was awesome. A thick vibrant glowing energy filled the room. I did it! We did it! Everyone felt it, everyone was affected by it. After snuggles and kisses and her first suckle we lifted the blanket covering her little body to see if she was a boy or girl. I thought she was a she and I was right. 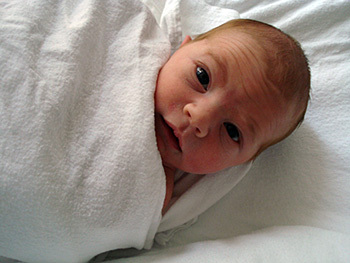 It was Emilie Skye; 7lbs 14 oz, born at 1:24pm on July 23rd 2009. The best day of my life. Giving birth was better than anything else. And I was higher than high for a week. My body rewarded me with a massive dose of feel-good chemicals. There was no come-down. The ecstasy of giving birth has changed to a deep and simple happiness in my everyday life. It was really hard and tiring, it was beyond intense, I thought it would never end, but I did it and it was all worth it.